thoughts, prayers, notices . . . This is for the whole Parish to read and use. Please let me know if you'd like to be a contributor. Jesus washes the feet of his disciples; he humbles himself to them to show them how they must serve each other. As we stand on the eve of Holy Week, we are invited to enter into the mystery of the cross. It is not possible to escape the difficult reality that God's beloved Son was delivered up to the most brutal, cruel and torturous method of capital punishment known to mankind. The only way the human race could be saved was by Jesus embracing the cross. Flesh and blood alone cannot penetrate this mystery – we need a revelation of the Holy Spirit. "The world is full of mysteries: heaven is all mystery to us earthly creatures. But whoever embraces the cross with open heart finds there the explanation of a thousand mysteries." (Archbishop William Ullathorne).
" . . . the Son of Man to be served but to serve, and to give his life as a ransom for many." The Lord uses this instance of naked ambition to teach true greatness: humility. But what is humility? We can be tempted to think that humility is about low self-esteem or running ourselves down, but humility has more to do with having a sense of God's greatness and of our fallenness – not in a way that crushes but in a way that puts the focus on God. What truly keeps us humble is the gift of self-knowledge: an awareness of our faults, sins and weaknesses. Padre Pio said, "Humility and purity are the wings which carry us to God and make us almost divine. Remember that a bad man who is ashamed of the wrong things he is doing is nearer to God than the good man who blushes at the good that he is doing." Righteous anger is rare; it was the anger that Jesus displayed when he drove the market traders out of the temple (John 2:13ff) but perhaps he is the only human being who has expressed sinless anger. During Lent we can examine our hearts and confess our sins, and it is an ideal opportunity to look at the causes of our anger. The way to overcome anger is to repent. We come before the Lord and confess our anger, then turn away from it. As we do so, the Holy Spirit gives us the grace to face the fear that can fuel anger. "Know this my beloved brethren. Let every man be quick to hear, slow to speak, slow to anger, for the anger of man does not work for the righteousness of God." (Jas. 1:19-20). Lent is a time to be healed, restored and lifted up. Repentance was for the people of Nineveh the gateway to life, and so it is for us. We follow One who is greater than Jonah and Solomon: we follow the Christ, the Son of the Living God. The Holy Spirit leads us to salvation along the well-worn path of repentance, sorrow and penance. The Queen of Sheba was moved by the teaching of Solomon. The Ninevites were compelled to repent by the teaching of the reluctant evangelist Jonah. How much more, then, should we be moved and compelled to repent by the teaching of the One who is greater than Jonah, Moses and all the prophets – Jesus Christ, our Saviour? From the Bible Alive today. Lent is also a time for us to discover anew and afresh the Gospel, the "Good News", which Jesus began to proclaim immediately after his time of testing. What is the Good News? The Good News is a message of two parts. The first part is to repent and the second to believe in the Gospel. We walk together on this road marked out for us by the Church and take up our call to resist the devil, knowing that he will flee, and to embrace freely and with love the Gospel, which is Christ with us and in us – the hope of salvation. Jesus wants each of us to possess a childlike faith – a pure , unassuming faith. This straightforward type of faith allows us to receive God's gift of salvation without pretention or hyporcrisy. It allows us to believe unswervingly that God is who that he says he is. Like children who rely on their parents' provision for their daily needs, we should humbly depend on our heavenly Father for provision in both the spiritual and the physical realm. A childlike faith isn't an immature faith but the very opposite. We mature in faith as we learn to trust the Lord our God with all hour heart, mind and strength. To mature in faith is a paradox: the more we grow, the more our childlike trust in God deepens and the more secure we feel in the sure knowledge of God's love. "So often people say that we should look to the elderly, learn from their wisdom, their many years. I disagree, I say we should look to the young: untarnished, without stereotypes implanted in their minds, no poison, no hatred in their hearts. When we learn to see life through the eyes of a child, that is when we become truly wise." St Therese of Calcutta. Do you wonder what relevance is the bible to me in my life? Are you confused as to what the bible is all about? Have you tried to read it but found it a struggle and gave up? If any of this is you then this course is just what you need…. Any adult 17 +yrs, or youth accompanied by their guardian, who wants to know more about the bible is welcome to join us – come, bring a friend. 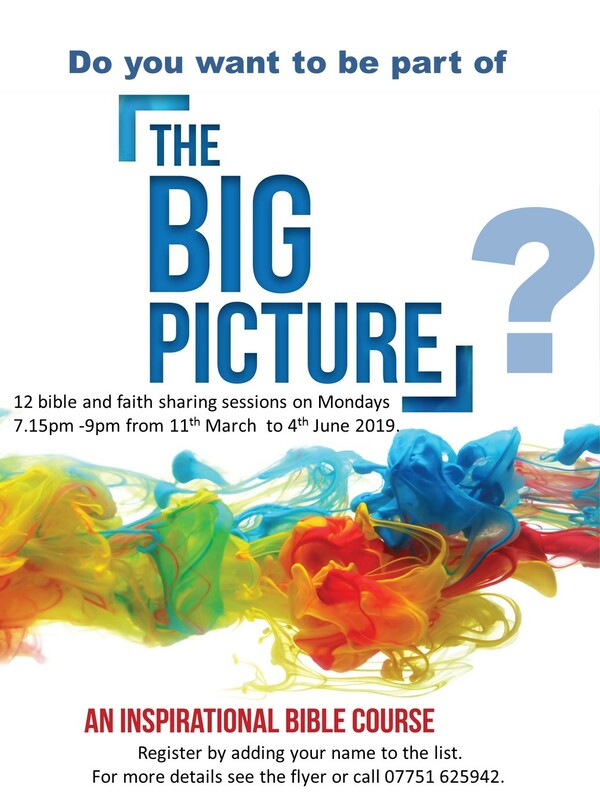 The BIG Picture course is free, however each participant will need their own Big Picture workbook (or daily prayer journal - price £10) and access to a bible. The workbook is essential for the course and includes a copy of the course DVD sessions and accompanying video-clips.. We have 12 engaging sessions taking us through Salvation History; starting at the very beginning with God the Creator right through to the End Times with the Second Coming of Christ. The course will be held at St Peter’s Church Biggleswade, on six Monday evenings during Lent (starting at 7.15pm on 11th March), and six consecutive Monday evenings during Eastertide (from the 29th April through to 3rdJune). Each weekly session will begin with an opening prayer, followed by 30 or 40 minutes of sharing what people have written in the daily prayer journal that week. After a mid-point coffee break a 15-20 minute inspirational DVD will be shown (each participant will have their own DVD in case they miss the session or wish to re-watch it during the week).The DVD session will be followed by a final prayer of blessing for the following week's prayerful study and we’ll close by 9pm. If you want more details, then call 07751625942. You may register on line at: goo.gl/18Ktz1 or add your details to the Big Picture list on the church notice board. The Beatitudes are not only for the saints but for all of us. They contain both promises of what we shall become and a revelation of what we have begun to be, albeit in perhaps a dim or somewhat hidden way. One way of living the Beatitudes and of putting them into practice is to memorise them, to become as familiar with them as we are with the Our Father or the Hail Mary. This simple step will help us to take them to heart and to cherish them during our day. St Augustine said, "We all want to live happily; in the whole human race there is no one who does not assent to this proposition, even before it is fully articulated." I thank you Father for everything that gives me happiness. I ask you to purify my heart so that I may know the blessing and the grace of putting the Beatitudes into practice.